I am currently accepting new undergraduate / graduate research assistant. If you are interested in doing research with me, please contact me for more information! RNA design algorithm takes an RNA secondary structure description as input and then try to identify an RNA strand that folds into this function-specific target structure. With new advances in biotechnology and synthetic biology, a reliable RNA design algorithm can be crucial steps to create new biochemical components. 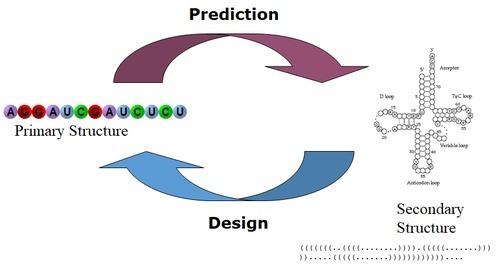 Our lab is interested in employing various computational intelligence techniques to propose the new paradigm to help with the RNA design problem. Recently, we have designed an algorithm SIMARD, which is based on the simulated annealing paradigm. idanceForms – a creative choreography sketchbook on iPad. Download idanceForms here. Computational Conductor – using machine learning techniques to understand and recognize conducting gesture. We are using machine learning techniques to seek out the Type III secretion system (T3SS) effectors which are harmful to human. A.J. Park and H.H. Tsang, “A Systematic Approach to Develop a Computational Framework for Counter-terrorism and Public Safety” Martin Bouchard, editor, Social Networks, Terrorism and Counter-terrorism: Radical and Connected, Routledge, 2015, 196-217. A.J. Park, H.H. Tsang, M.Sun, and U. Glässer, “An Agent-Based Model and Computational Framework for Counter-Terrorism and Public Safety Based on Swarm Intelligence.” Journal of Security Informatics, 2012, 1:23. In my classroom and lab, I have overseas the development of over 150 mobile applications. See here for some examples.